One-to-one emails, or personal emails, are one-off messages that you can send to contacts from the Contact Overview page or a contact profile page. If you are on a Plus, Professional, or Enterprise plan, you can also send a one-to-one email to a contact from their deal record. 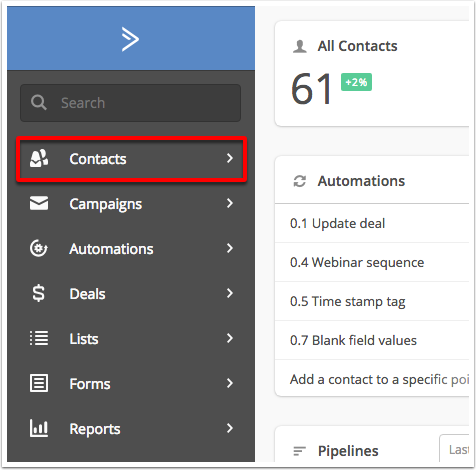 In this article, you'll learn how to create and send a one-to-one email to a contact from the Contacts Overview page and a contact profile page. 1. Click "Contacts" on the leftside menu. 2. Click the "Email" button next to the contact you wish to send a one-to-one email to. 3. The message composer will open. Type a subject line and your message into the fields provided. Note the bold, italics, and strikethrough styling options on the lower left of the composer. To add bullet points, insert a link, or switch from html to a plain text email, click the more options icon. 4. If you want to use a template for this message, click the “Saved Responses” icon and select which Saved Response you want to use for this email. Click here for more information on using Saved Responses. 5. You can insert a personalization tag in order to add values from the contact record into your message. 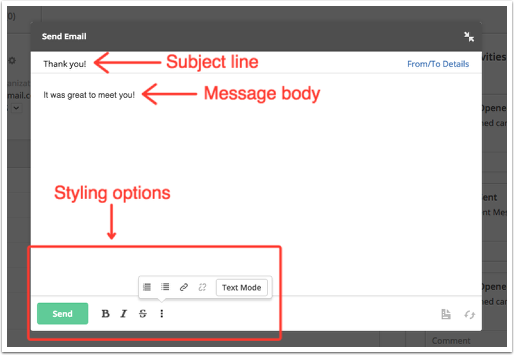 To do so, type the percentage symbol (%) into the body of the message. You’ll be presented with a menu of fields you can insert. After selecting the field, you’ll see a blue placeholder with an inserted value. 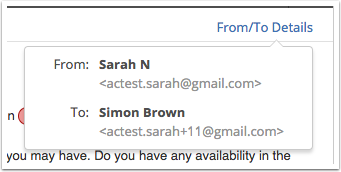 If you are using personalization tags in your message, they will appear as blue and will populate with values from the contact record. If any of the personalization tags appear in red, then this means the contact does not have a value for that field. 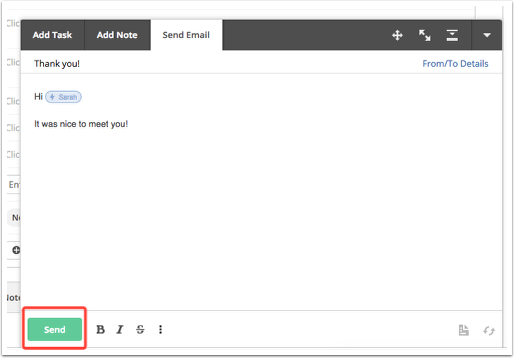 If you try to send a personal email with a tag highlighted in red, you will be asked to add a value for that field before sending your message. 5. 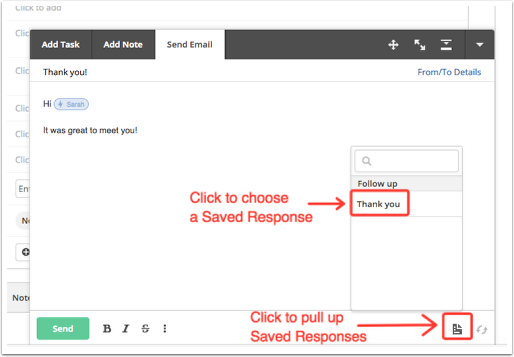 To add a contact to an automation when you send the email, or when a contact replies to your email, click the “Automate this email” icon (1) located next to Saved Responses. 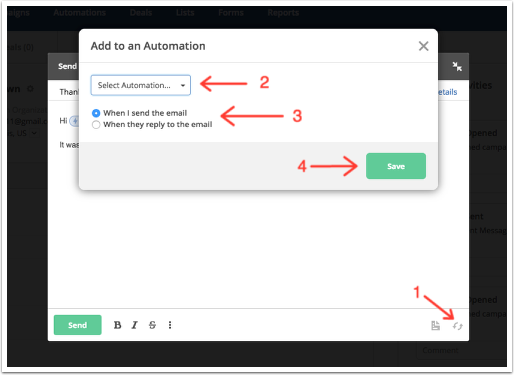 Choose the automation (2) you wish to add your contact to and select if you want them added (3) when the email is sent or when they reply. Click “Save” (4). 6. Clicking the “From/To Details” will show you the From email address and To email address. The From email address will be the email address associated with the account user and cannot be changed. Note: You can also select a contact from the Contacts Overview page and then click “Send Email” in the Compose bar located at the bottom of the Contact Profile page.